After entering the dressing room, I put on the pair of jeans in my typical size and, with a sigh of relief, took them off because they were way too loose. On to the smaller size! Woo-hoo! I couldn’t wait to see how those fit. After they were buttoned and zipped, I stood there in shock for a moment. Those didn’t fit either. I needed to go down to the next smaller size! The kind saleswoman got me the jeans and I paused before I tried them on. Did I really lose enough weight to go down two sizes?! As I drew the jeans up my legs, I could feel the denim slightly hug my thighs and sit comfortably around my hips and lower belly. Oh my goodness, they fit! Pride and delight washed over me as I stood staring at myself in front of the mirror. I thanked dieting for giving me this amazing moment. Years later, when my mind finally agreed with my body that that dieting was harmful, I looked back at that moment in the Gap dressing room and realized that I would not experience that moment of euphoria again. Although I knew I would be healthier carrying around a few more pounds, I nevertheless mourned the fact that I would never have that feeling of success after weight loss again. IE brought about other instances of mourning that I wasn’t anticipating. The whole purpose of me dieting was to achieve a certain body shape. Yes, I wanted to be thinner in general, but I loathed my stomach rolls. When my parents were young, their bodies were in proportion, but, as they aged and put on weight, their bodies became apple-shaped. This was my genetic destiny. There are many different body shapes, but I have always disliked this one in particular. The dieting industry tells me that this shape is ugly and unattractive. Women are supposed to have voluptuous, hourglass figures. I began to see apple-shaped women as pregnant-looking and out of proportion and I began despise my stomach. As I lost weight, my stomach became smaller and I finally achieved a flat, toned stomach.3 But it cost me my health. I had always wanted a flat stomach, so I resisted putting on weight because I knew that I would lose my ideal body when I began to eat more regularly.4 I lamented the fact that my stomach wouldn’t be as small as it used to be; I couldn’t help it. But I realized I could never look that way again and be healthy at the same time. After many up and downs with IE, I slowly began to feel comfortable with my newer, softer body. I had always associated the concept of mourning with death, so it had not occurred to me that I would go through a period of mourning when giving up dieting. I grieved never again being thrilled about fitting into smaller pants, having a flat stomach, and being over-the-top excited about food. With that, I am learning to accept that I will look different when I’m healthier. I don’t see my ribs or hip bones as much anymore because I have a fuller midsection…and this is a good thing! I am more accepting of my body and at peace with food in general, so the trade off is worth it. 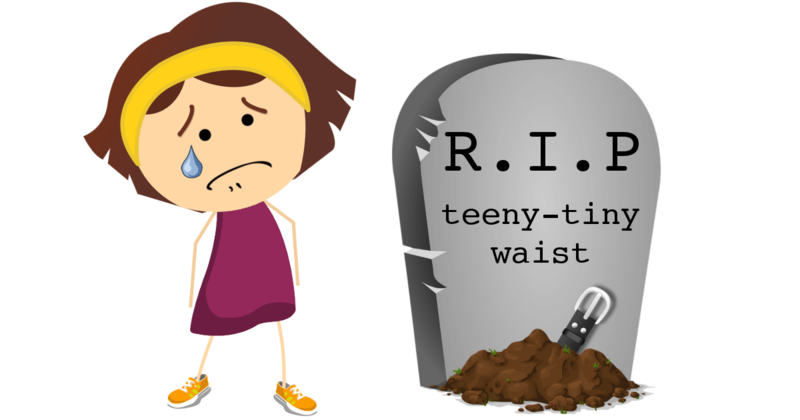 Did you go through a mourning period once you got into intuitive eating? Please share your thoughts in the comment section below. 1Yes, it is mentioned in the book. I think in my haste to become an intuitive eater, I glossed over that small section. 2I believe that numbers are not important here, so I decided not to include any actual sizes. We are bombarded enough with numbers as it is. I wrote about this in “Numbers, Numbers Everywhere”. 3Never mind that you could see quite a few of my bones too. 5This is due to something called “habituation”. More to come on that topic!! Thank you for this post. It really hit me tonight as I make peace with the body I live in today. When I was smaller I was not happier, I was miserable sans those moments of indulgence in the mirror, but day to day I as sad. Letting go of the brief euphoria of “perfection” for the blanket of self love and freedom from the merry go round of dieting is definitely a part of my journey. I appreciated the sisterhood and wisdom of your blog. I also feel a sense of sisterhood when others go through a similar journey. Knowing we are not alone makes it a teeny bit easier. Thank you, thank you, thank you for your post! Mourning is an accurate way of describing the feeling I get when I want to go back to the way I used to diet only to get to a smaller size. I feel better about my body and my eating now. I am strong and healthy, but it’s at a larger set point. I struggle some days, like today, when I wish I was smaller. But then I come across others that feel the same way as I do and I realize I’m on the right path – MY path. It feels great to be a part of this sisterhood! Yes, there are times when I feel like I’m the only one experiencing these emotions, but, like you, I always feel better when I encounter someone who is on the same path. This is so hitting home with me. I miss those days of fitting into all those teeny sizes. I remember once having to go into the girls section and I was elated. I’m sad that I couldn’t keep the body and be healthy but it is impossible. Eating normally will never equal tiny body. Still getting used to the idea and working on accepting myself. Great read! I sometimes had to go into the girl’s section too, which meant I was very small. I was thrilled! But, like you said, it is impossible to be that teeny and be healthy at the same time. Here’s to eating normally and good mental health! I remember going into the juniors after the birth of my son when I was back on Weight Watchers. I loved that, I was 35. About 5 years ago after my last big diet/exercise effort I was wearing smaller jeans than my teenage daughter. I was about jumping up and down in the dressing room. Wonder how that made her feel? If you ever ask your daughter about this, I’d be curious about her response. It may have stuck with her or she might have brushed it off. Deborah thank you for your honesty in this post. It takes bravery to admit what you have. You asked if we’ve gone through a mourning period. For me yes I have. It was when I realized that I would probably not lose weight practicing I.E. But the good news is that I have traded it for peace! Right? I just bought pants in my actual size and did not catapult into diet mentality. Peace in action.